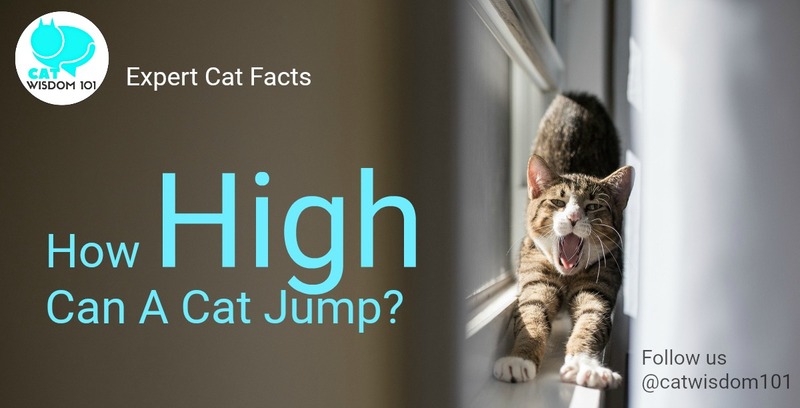 There are many factors to consider when determining how high can a cat jump. 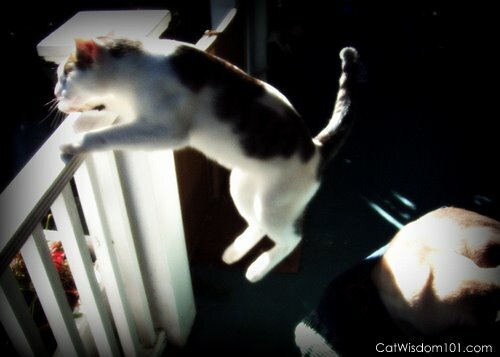 A young athletic cat obviously can jump higher than a tiny kitten, an obese kitty or elderly cat with arthritis. Certain stocky or cobby breeds or those with short legs like munchkins won’t reach heights of a limber Siamese. We have a baby gate to keep our Siamese Merlin from wandering off the porch. His leaping days are long over. There was a time in his youth when he easily jumped up to the top of refrigerator or a garden fence. In the photo below, the super-athletic Odin, bypassed Merlin (napping) without any effort gracefully jumped over railing yesterday. How high can a cat jump? 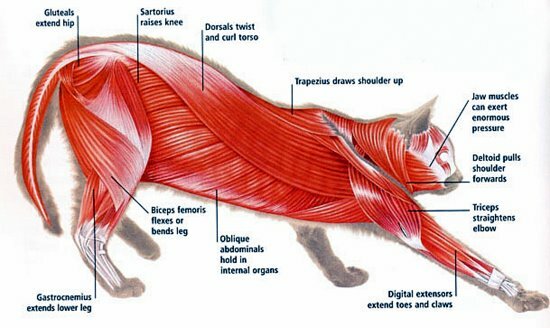 A young, healthy, average-sized cat can jump about six times their length or over eight feet in a single bound thanks to powerful muscles in their back legs (see illustration). Practice makes purrfect. Playing with your cat with wand toys to encourage jumping will strengthen the muscles. Not all cats enjoy climbing or jumping but the only way to find out is to create a safe environment for climbing with shelves and cat trees. 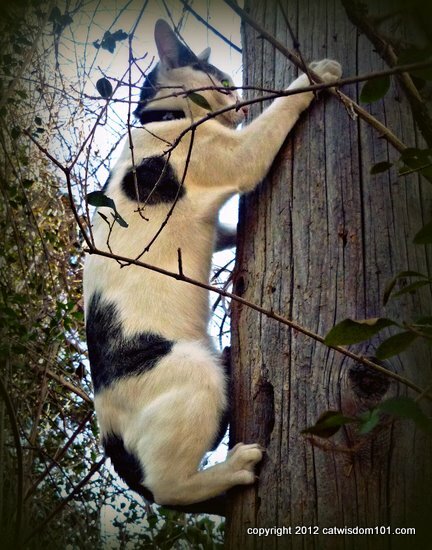 Indoor/ outdoor cats who enjoy climbing trees usually develop strong muscles for jumping like Odin. Always respect your cat’s innate nature and individual personality. Note the use of his tail for balance. It’s no wonder table and counter tops are a breeze for most cats to jump on. Fortunately, Odin answers to the “come “command. 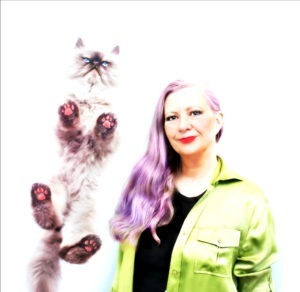 Visit us tomorrow for easy tips on teaching your cat the “come command “. Note the powerful muscles Odin uses to climb are the same ones which help him jump. My son’s kitten, who’s name is Miss Titan is a mean little girl who jumped from the couch to the door, about six feet without touching the ground. Well, my son and his girlfriend didn’t believe me. I grew up with cats and I know they can do amazing things! Which I have two of my own, and my boy cat Shadow has diabetes who is 18 years old. My family has had Siamese cats for over 50 years, and I have seen them jump to the top or refrigerators and doors dozens of time. The “springs” in their hind legs are amazing! Some how the mom missed commenting on this earlier this week. Several of us have jumped over 3 baby gates stacked on top of each other (Oui Oui, Mica Moo and Carl}. The mom didn’t think it was possible, but we land momentarily on the top one before going over the jump. Julie just plows through them. Also very effective. My lady thinks I’m an athlete because I can jump up to get the peep hole on her front door. I just need to see who’s there before she opens it! You know what ? I have to confess I can’t jump theat high , Just half of that ! but my next door’s cat can do exactly what you said 8 feet high in one jump which is really cool !!! My kitties are great jumpers. It works out great- we are a tag team effort to access stuff on the counter neither of us could get to and get open alone. SCORE! Abby is now 12 and I have seen her best jumping days behind her. So we adjust and she lets me pick her up and put her in spots she couldn’t otherwise reach. When Sister Zoey first came here she jumped over a 6 foot screen to get out of her private room! Milo can jump really high ~ Alfie can’t. We’ve always been amazed at the difference between them. I knew that Knuckles could jump high, but I didn’t realize the potential. I’m gonna go measure him and make sure he’s living up to his potential. Excellent discussion and illustration. I once convinced my family that cats have genetically more collagen in their bone marrow. Emma would jump up to the fridge from the floor. Often.